This dish reminds me of childhood, since my mother used to make breaded mushrooms for us when we were growing up. Although I don't eat them very often anymore as an adult, they're still a personal favorite of mine. For me, breaded mushrooms are more of an old school "comfort food," which I'll make once in a blue moon, when the mood strikes. 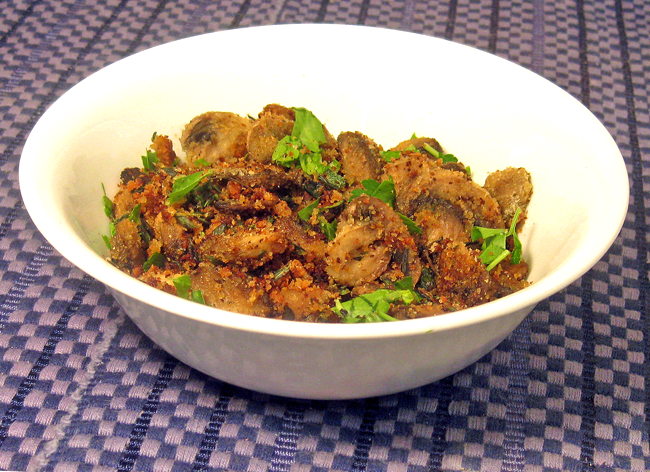 A simple side dish that can be cooked in a few minutes flat, breaded mushrooms are packed with flavor & texture, & go well with a variety of entrées - fish, chicken, steak, lamb chops, etc. This recipe is a much healthier version than the usual incarnations, which typically contain way too much saturated fat. [There's a minimal amount of butter (i.e., 1/2 Tbsp. spread out over 4 servings), which is used more as a flavoring agent, and also to help brown the mushrooms.] So, now you can go ahead and thoroughly enjoy your breaded mushrooms without feeling like you just ate the nutritional equivalent of a pile of french fries. ;) Of course, as always, moderation is key. Enjoy! Directions: In a large (12-13") sauté pan, heat extra virgin olive oil on medium heat, then melt butter. Reduce heat to low, add bay leaf & mushrooms & cook until tender, about 5 minutes. Season with salt & pepper, sprinkling from a distance for even distribution. (Salt aids in moisture reduction.) Turn up heat to medium, add breadcrumbs, season with thyme, oregano, & marjoram, & sauté mushrooms for another 5 minutes, until golden brown on both sides. Add the scallions in the last minute of cooking, if using. Discard bay leaf, garnish with fresh parsley, & serve. Chef's Notes: *If you don't happen to have plain bread crumbs on hand, you can very easily make them yourself. Simply pulse stale bread in a food processor until finely ground. Alternate Preparations: To make this recipe vegan friendly, simply substitute 1 Tbsp. olive oil for the 1/2 Tbsp. butter + 1/2 Tbsp. olive oil combination. It might take a bit longer to brown the mushrooms (due to the absence of butter), so adjust your cooking times accordingly.